As of July 1st 2015 and after almost 15 years working in Korea and China , Ioannis Chiotopoulos returned to Greece in order to take the position as Regional Manager for Maritime Region East Med., Black & Caspian Seas which was expanded on 1st January of 2016 and renamed to Maritime Region South East Europe & Middle East. A marine engineer and naval architect by education, Ioannis Chiotopoulos joined DNVGL in 2000 after several years of work experience in Greek shipping companies. 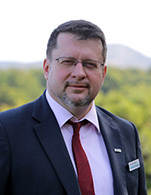 He has held a variety of positions within the company, such as Fleet in Service and Newbuilding Surveyor, Site Manager, New-building Production Manager and District/Area Manager in Greece, Korea and China.